The obvious joke here is: first of all you should stop clicking on so many headlines like the one attached to this post. Stop reading about “life hacks” and go out there and start hacking away at whatever it is that makes you feel like you’re truly living. I, too, am a sucker for these sorts of headlines and articles and find a tremendous comfort and relief of inner turmoil in reading self-improvement content of all varieties and provenance. There’s a reason the New York Times gives such prominent placement to its “Smarter Living” section. As of this writing the section’s promo was placed smack in the NYT site’s center column, right below the lede article and a small house ad for the paywall up-sell. “Smarter Living” articles in the Time are always among the “most emailed” stories. 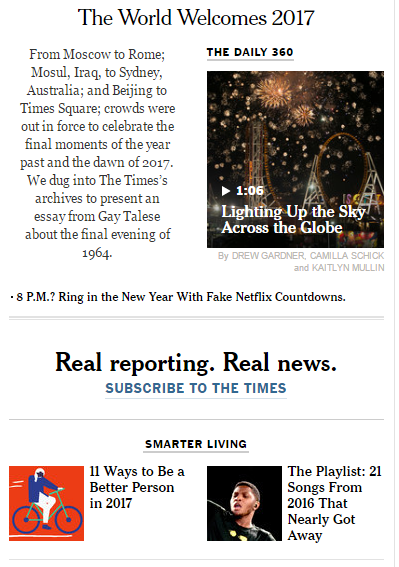 And how is the Times ringing in 2017? With an international fireworks montage and “11 Ways to be a Better Person” of course. So there’s the “irony disclaimer” you’ve come to expect from Digital Detachment. Now, without further ado, let’s get along to a nicely packaged list of ” highly actionable” drills you can do to IMPROVE YOUR LIFE RIGHT NOW! No, seriously. All these drills will improve your life. They’ve improved mine when I’ve tried them. And some of them are now permanent habits. 3. Uninstall your two most addictive apps for the whole week. You can always re-install them at the end of the drill. You might think Facebook, Twitter etc… would be the best candidates, but why not beat silicon valley at its own game and “consult the data.” Some devices make it easy. For others, you’ll have to some more digging. I found my own two most addictive apps were gmail and twitter. So I uninstalled them. And I was really uncomfortable for a couple days … But now I don’t even notice they’re gone. Meanwhile, I still check gmail about 50 times a day on my laptop or desktop. That’s more than enough. Nobody has really complained that I use Twitter far less frequently. I’ve recaptured that browsing time for more focused purposes, like writing this post. 5. Circle another weekday on the calendar this month and plan to enact a “Voluntary Brownout.” This is a quirky take on drills #1 and #2 above, but this one’s a lot more fun and memorable. In short, you’ll want to blow your fuse box for the evening and go back to pioneer times. Or at least to the last time your power went out. Light some candles, grab the flashlights, dust of the guitar… Blow your fuse box, blow your mind with the radical disruption of your routines and communication patterns with your family. Here’s a post about my own Voluntary Brownout. 6. Pick a month on the calendar to abstain from all episodic TV. You can’t binge watch if you don’t watch in the first place. The Lannisters and the Starks will still be around when you’re done with your cleanse. In the meantime, you’ll sleep better, have a better grip on reality, and be more productive. Here’s a long piece I wrote about how happy my breakup with episodic TV made me. 8. Along the lines of #7 above… Take a 30-day Amazon Prime break. Go ahead. Cancel that membership and save the $8.25. Mr. Bezos will be glad to pro-rate your cancellation refund and even gladder to start you back up again after the month is over. Take advantage of the “break” to observe how much your spending drops when you’re not one click away from your heart’s desire showing up at your door with two-day free shipping. If you really need something, you can just pay the shipping or batch it all into a super saver order. If you watch TV on amazon, you can plan to take your Prime break during your episodic TV cleanse. Amazon is a wonderful medium in many ways, but its constantly-refined-and-perfected message is CONSUME! And that message needs to be digested in mindful doses. 9. Keep a tally of when you switch away from working on medium-length task that ideally should be completed in one continuous sitting. For example, I started this blog post at 4:29 pm New Year’s Eve. I stopped at 4:31 to warm up my coffee. I stopped again at 4:46 when Spotify fritzed out. I broke to cook my wife dinner at 5:22. I started writing again at 7:15 pm, and now I’m finishing up right around 8 pm. This is actually a miracle of focused mindfulness. Most of my 1-2 hour tasks are littered with a dozen or more interruptions — most of them avoidable, mindless, and self-imposed. Fortunately, there’s something powerfully restraining about the mere act of observation. By keeping a notepad tally of my switching activity, I was successfully able to avoid most of the idiotic switching I’m prone to. 10. Take your digital sabbath practice to the next level by scheduling it on a workday. Clear the day off with your boss and now the time is yours … Mister Zuckerberg and Mssrs. Dorsey, Brin, Page, and Cook are not invited either. Go ahead and enjoy the uncrowded supermarkets and movie theaters and hiking trails and museums. You work hard for this sort of pleasurable freedom. Enjoy it if you can.